The Motmots (bird family Momotidae) are restricted to the Neotropics, which includes southern Mexico, Central and South America and the West Indies; although the largest diversity occurs in Middle America (Mexico, Central America, and sometimes including the West Indies). These woodland or forest birds have colorful plumages and a heavy bill. 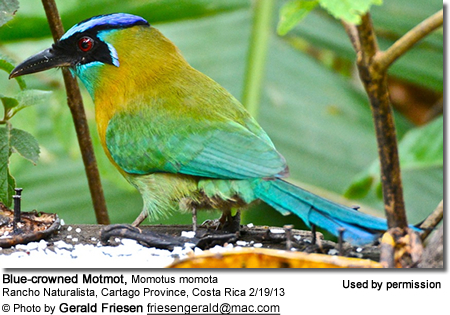 All, except the Tody Motmot, have long tails sometimes with a racket-like tip. Motmots often move their tail back and forth. Motmots make their nests in tunnels in banks. The average clutch consists of 4 white eggs, which hatch after about 20 days. Both parents raise the young. The young fledge about 30 days later. They mostly feed on insects and lizard, but will also take fruit. Please Note: The images on this page are the sole property of the photographers (unless marked as Public Domain). Please contact the photographers directly with respect to any copyright or licensing questions. Thank you. BeautyOfBirds strives to maintain accurate and up-to-date information; however, mistakes do happen. If you would like to correct or update any of the information, please send us an e-mail. THANK YOU!